Inside Star Trek - ZineWiki - the history and culture of zines, independent media and the small press. 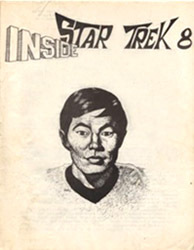 Cover drawing of George Takei as "Mr. Sulu"
Inside Star Trek was a media science fiction fanzine by Ruth Berman devoted to Star Trek (the original series). Twelve issues of Inside Star Trek appeared, beginning in 1968. Along with Ruth Berman's other title Despatch, it was one of the few fanzines to appear while the original run of Star Trek was being broadcast. It was the 'official' Star Trek newsletter, and editor Ruth Berman had full access to the Star Trek cast and set. Assisting in the publication of the fanzine was Dorothy C. Fontana, Story Editor and writer of several Star Trek episodes. The first issue was published in July 1968, with a cover by Rae Ladore, and illustrations by Alicia Austin (Kevas and Trillium), and Gilbert Draper. Articles were by Ruth Berman, Dorothy Fontana, and a press release by Gene Roddenberry. Issue 2 appeared in August 1968. Issue 3, from September 1968, featured an interview with DeForest Kelley by Ruth Berman. Issue 8 featured an interview with George Takei by Ruth Berman. Issue 9 featured an interview with Star Trek director Charles Washburn. Issue 10 included an interview with Star Trek music editor Richard Laphan. Issue 11 featured an article by Kay Anderson (ST-Phile). Issue 12, from 1969, featured writing by R. Dyan, and articles on Star Trek staff George Merhoff and Art Director Walter "Matt" Jeffries, by Dorothy Fontana. After issue 12 appeared, Ruth Berman handled the editorship over to Susan Sackett, who renamed it Star Trekennial News. Ruth Berman then began publishing her next Star Trek related title, T-Negative. In the late 1950s, Ruth Berman co-published All Mimsy with Eleanor Arnason and Ron Whyte. in the early 1960s she published first NeoLithic, and then Dinky Bird. In the 1970s, along with T-Negative, she also published The Star Trek Songbook. In the 1960s and 1970s, Ruth Berman was also publishing No, and the Sherlock Holmes anthology, SH - sf Fanthology. This page was last modified on 20 December 2017, at 09:33.